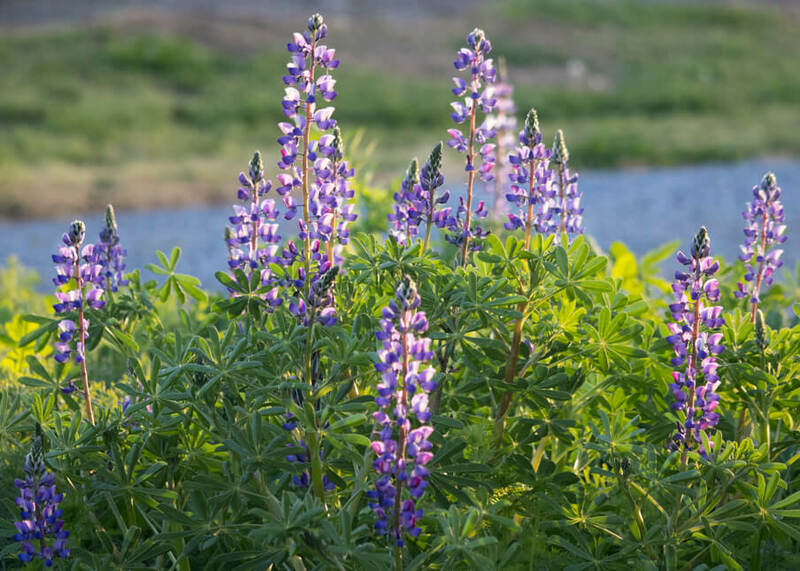 In my yard, the snails and slugs are just waiting to mow down my seedlings and flowers – especially lupine and delphinium. It can be devastating to put so much work into your garden and overnight they can completely clear out an area and leave you with stubs. My yard is really loaded with a couple different types of snails, plus slugs. I don’t know if I’ll ever be able to get rid of them (they hitchhike into my yard in nursery plants) but I’m getting better at keeping them from destroying my plants. Keep areas clear of hiding spots. Clean up any areas that stay moist and cool (yes, I know that isn’t always easy!). Whenever possible, only water in the morning so snails/slugs can’t enjoy your moist garden at night to get around. Use a flashlight in the evening to pick them up. If you or your neighbors have chickens, they will be much appreciated! Slugs especially love beer. Fill a shallow container with beer and push into soil to be level so slugs can crawl in and drown. However, remember that the dish should not be accessible to birds (they’ll get drunk!). You can put it out at night and take out early in the morning. Or you can cut holes the sides of a plastic cover so that only slugs can enter. You can also use a snail bait, like Sluggo. It’s safe for an organic garden and can be used around pets/wildlife. However, it must taste pretty good to more than snails because my cats love it. As soon as I put down Sluggo, the cats are snacking on it. To keep them out of it, I sprinkle crushed red pepper flakes over Sluggo. They hate those spicy flakes which I use anyway to keep them out of flower beds. The only problem with these solutions is that they aren’t instantaneous. When I see damaged plants, I want it to stop that day. What’s the solution? 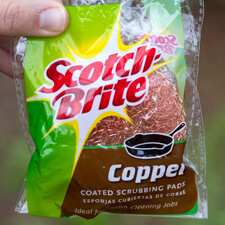 Copper scrubbers. Snails and slugs are obviously covered with slime which reacts to copper, giving them a feeling akin to an electrical shock. Thus, they avoid copper. I buy mine at OSH – it’s a package of three scrubbers. Unfasten the wire at the center and unroll the scrubber. After unrolling, the scrubber tube is about 21″ long. This will give you about 6-7 barriers. I cut lengths to about 3-4″ long. Any type of scissor will cut easily through the scrubber. After cutting, roll the scrubber back into a circle to place around the plant. To hold them in place, I’ve used little sticks or even bobby pins. Echinops seedling protected by scrubber. For taller plants, be sure that no part of plant touches the ground outside the scrubber. A couple downsides to copper scrubbers: If you have a lot of plants, that’s a lot of scrubbers! Also, they aren’t infinitely effective. They lose their electrical jolt when they become tarnished. However, I’ve found that by the time they are tarnished, the plant is large enough to withstand snails/slugs. Plus, I’ve had plenty of time to use other methods like Sluggo to remove or at least substantially reduce the snail/slug population. An upside: I’ve found another purpose for tarnished scrubbers. I place them around perennials that freeze to the ground. 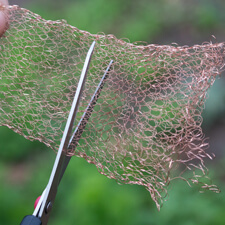 This is really helpful in the spring when I’m digging in new plants. I can see exactly where to avoid. 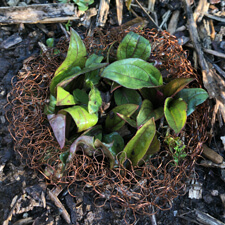 In the adjacent photo, I placed a scrubber (used bobby pins to keep it in place) around echinacea after it froze, then cut off the foliage. 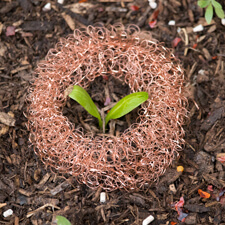 When the plant re-emerged, then I removed the copper scrubber. Many years ago, we purchased Decollate snails to minimize our garden snail problem. Decollates eat garden snails pretty voraciously and it was fairly effective. 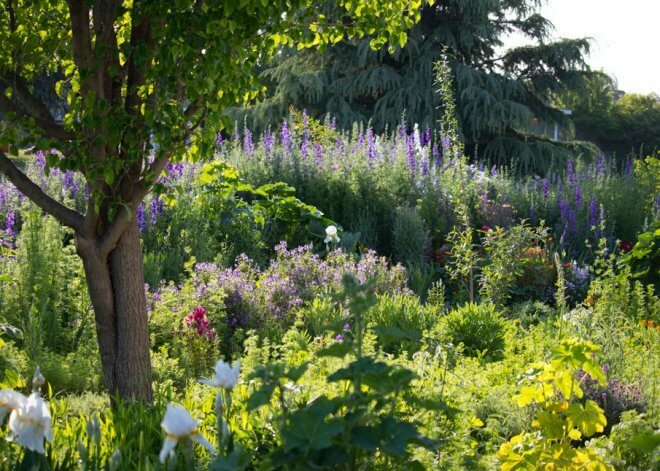 However, at that time we had a pretty small garden. Recently, I realized that we already have Decollate snails which I hadn’t seen previously. So it’ll be interesting to see if they are able to eat away at our garden snails effectively. The advantage to Decollate snails: they don’t eat as much foliage as garden snails. Do be aware that if you purchase Decollate snails, they will be affected by use of Sluggo or other snail bait. Coffee Grounds & Crushed Egg Shells: This has mixed results. Some gardeners absolutely swear by coffee and shells and others say their slugs/snails go right over them. 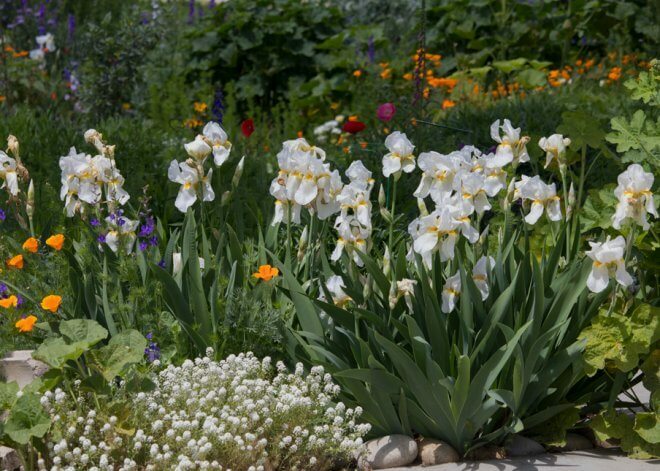 Epsom Salts: Many gardeners report this to be effective and can be helpful to your soil if it is deficient in magnesium. Epsom salts doesn’t kill them, but can deter snails/slugs. Like Sluggo, it doesn’t last and must be re-applied. Salt: Highly effective, but do you really want to add salt to your soil? I don’t recommend it. Other types of snail bait: Be careful. Some contain Metaldehyde which is poisonous to dogs and cats. 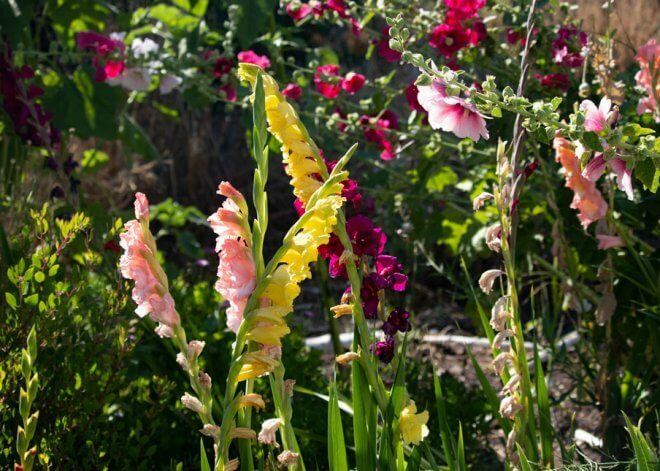 What works in your garden? I’d love to hear from you. That copper scrubber tip!! Every year I have to fend off slugs to protect my emerging dahlias—definitely going to try the copper scrubber next year! Brilliant! Thanks for the copper scrubber tip. Have just this minute ordered a pack. 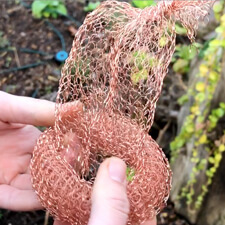 Am plagued by slugs and snails here in UK and have spent a small fortune on copper tape for putting around pots but have avoided putting anything in the ground as it would be eaten. Great, let me know how the scrubbers work for you! @gardening-for-purple. The copper scrubbers turned out good. They don’t fit round the largest pots but are great for small medium ones and cost less than copper tape. I did brave putting a few young plants in the ground with little gravel circles around them but, as usual, they were eaten to stumps by morning. 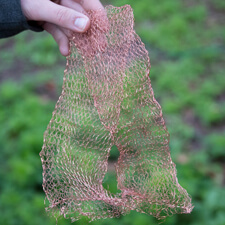 Next time something is getting planted in the ground it will have a copper scrubber around it! Can’t use UK equivalent of Sluggo as have a canine garden helper. Glad to hear the scrubbers were helpful! For a bigger pot, consider cutting a scrubber on the long side and then wrapping around the pot. 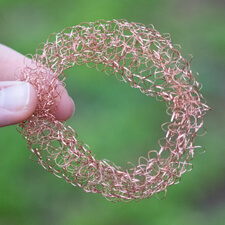 When you unwind the scrubber, there is an extra piece of copper wire that you could use to connect the ends. Regarding Sluggo, if it’s truly equivalent then it’s safe for pets – check label. My cats have eaten plenty of it and that’s why I put down red chile pepper flakes at the same time. Cats and dogs really don’t like the flakes – they are really hot and it goes up their noses when they sniff the area.